HIGH POINT, N.C. – As the High Point Rockers are opening their inaugural campaign on the road, fans of the team will be able to experience a once-in-a-lifetime opportunity at BB&T Point. On Sunday, April 28th, while the Rockers finish up their season-opening series at Lancaster, the iconic Budweiser Clydesdales will be on hand at BB&T Point for fans to meet. The event will last from 2PM to 4PM and launches a partnership between the Rockers and the Budweiser brand for the 2019 season and beyond. To insure entrance into this high-profile event, fans must click here and download a free ticket. In addition, fans that show a valid ID will be able to sample some of the Budweiser products that will be served all summer at BB&T Point, while all in attendance will have the opportunity to pose with the majestic representatives of this storied brand. Throughout the 2019 season, Anheuser-Busch and other Great Craft brands will be provided by the Triad’s own R.H. Barringer Distributing from Greensboro. Each Rockers home game, and other non-baseball events, will feature various Budweiser drinks, as well as other highlights of this partnership including giveaways, special events, and more. “We at RH Barringer Dist. Co. Inc. are very excited to be working with the High Point Rockers in their inaugural season,” says Tim Bauguess, General Manager of RH Barringer Dist. 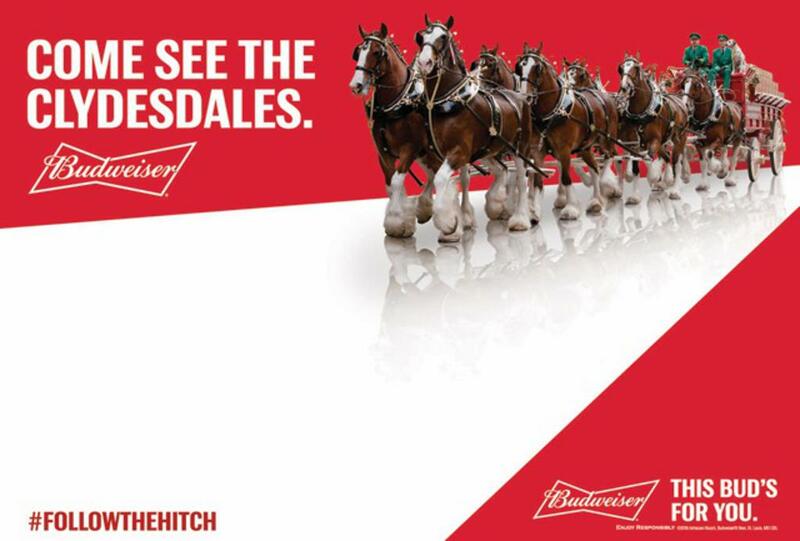 Co.
Making their first appearance in 1933, the Budweiser Clydesdales were originally a gift from August A. Busch, Jr. and Adolphus Busch to their father in celebration of the repeal of Prohibition. Since then, they have been featured in a myriad of Super Bowl commercials, events across the country, and played a prominent role in two Presidential inaugurations. These American icons are easily recognized for their substantial feather, the long hairs of the lower leg that cove the hooves. Fans who attend the event are encouraged to post pictures using the hashtag #FollowTheHitch. This exciting event will take place just four days before the Rockers christen their new, state-of-the-art ballpark on Thursday, May 2nd when they host the defending Atlantic League Champion Sugar Land Skeeters at 7:00pm. Tickets for that game, and each of the Opening Weekend games, are going fast! Fans are encouraged to slide to HighPointRockers.com to reserve their seats for this historic season.